The British Safety Council presented the prestigious Sword of Honour and Globe of Honour Awards for the exemplary management of health, safety and environmental risks to businesses from around the world, at the awards ceremony held on Friday, 24 November at Drapers’ Hall in the City of London. The winning organisations came from a wide range of industry sectors in the UK, mainland Europe, India and the Middle East, including construction, education and training, energy generation and distribution, food and drink, leisure, logistics, manufacturing, retail and transport. The 57 Sword of Honour and 15 Globe of Honour winners have demonstrated to an independent adjudication panel a proven track record of excellence in managing risks to workers’ health and safety and/or to the environment from the organisations’ activities. 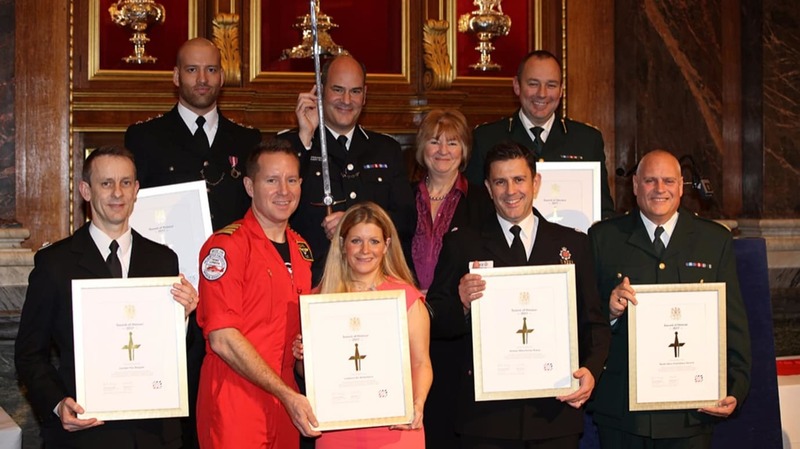 This year, the British Safety Council has also presented a special Sword of Honour Award to the emergency services in recognition of their heroism, service and dedication to protecting the safety and health of people throughout the UK. The special Sword of Honour was presented to the representatives of London Metropolitan Police Service, Greater Manchester Police, London Ambulance Service, North West Ambulance Service, London Air Ambulance, London Fire Brigade, British Transport Police and Royal National Lifeboat Institution. Mike Robinson, Chief Executive of the British Safety Council, congratulated all the winners, saying: “Today we are celebrating your achievement. However, being an exemplar carries some weight of responsibility. The last 40 years have seen huge improvements in health and safety across the UK, but there is still much to do, particularly in the areas of health and mental wellbeing. As Sword and Globe of Honour winners, you are committed to continual improvement and you are already addressing these issues. However, there are many organisations who have no idea where to begin. They are looking for leadership in this area and who is in a better position to provide it than you? Lawrence Waterman, chair-designate of the British Safety Council, said: “I am delighted to be taking on the role of Chair at a point when the organisation is embarking on exciting and innovative projects. Social media, robotics, digitalisation, longer working lives and Brexit will all be changing the world of work and the British Safety Council will change in response. Our plans and aspirations will focus on the use of technology to revolutionise training, on developing our dedicated business in India to support worker protection in that country and we will tackle health with a laser-like focus on mental health and wellbeing. The British Safety Council paid particular tribute to eleven organisations that won both awards – the Sword of Honour and the Globe of Honour. These were:Arya Sasol Polymer Company, Bahrain Petroleum Company, Dubai Electricity and Water Authority, Mount Anvil (Hampstead Manor), Mount Anvil Ltd (Royal Docks West), Qatargas Operating Company Limited, Commercial and Shipping Group, Shipping Department, TEVA UK Limited Castleford, Unipart Logistics Cowley, Unipart Logistics Limited Baginton A, Unipart Logistics Limited Baginton B and Unipart Logistics Ltd Honeybourne DC.